Introducing Sentient Search. The parts and device search that simply knows what you're trying to find. Is there a part, tool or other item that we don't carry and you'd like to see? Owners of a Unibody MacBook Pro laptop are probably already aware that failure of the hard drive flex cable is a common issue. While it affects just about the entire Unibody lineup, the Mid 2012 MacBook Pro 13″ (Model A1278) is especially prone to this type of failure. What is it that makes the Mid 2012 release special in this regard? A design flaw in the flex cable that seems to be compounded by the properties of the aluminum housing. Our repair services department noticed this issue when they’d replace a bad cable, only to have the customer return a few months later with another bad cable. And possibly again with yet another bad cable. It didn’t matter if we used a used cable or a new cable in the replacement. Customers kept returning with the same persistent issue. We had to figure out what was causing the issue and find a solution. If you’re in need of one of these notorious flex cables, we guarantee our cables with a lifetime warranty. So if it ever fails, we’ve got your back. The cable runs from the logic board SATA connector, across the optical drive and then underneath the hard drive, finally connecting to the SATA connector of the HDD. Though this keeps the cable nice and secure, it also sandwiches it between the hard drive and the metal casing. In theory, it seems great, but unlike the exterior aluminum surface which is machined to an extra smooth finish, Apple skimped on machining the interior surface to match. This hasn’t been an issue with most of the MBP Unibody laptops, but the 2012 MBP 13″ hard drive cable was made a bit too thin. 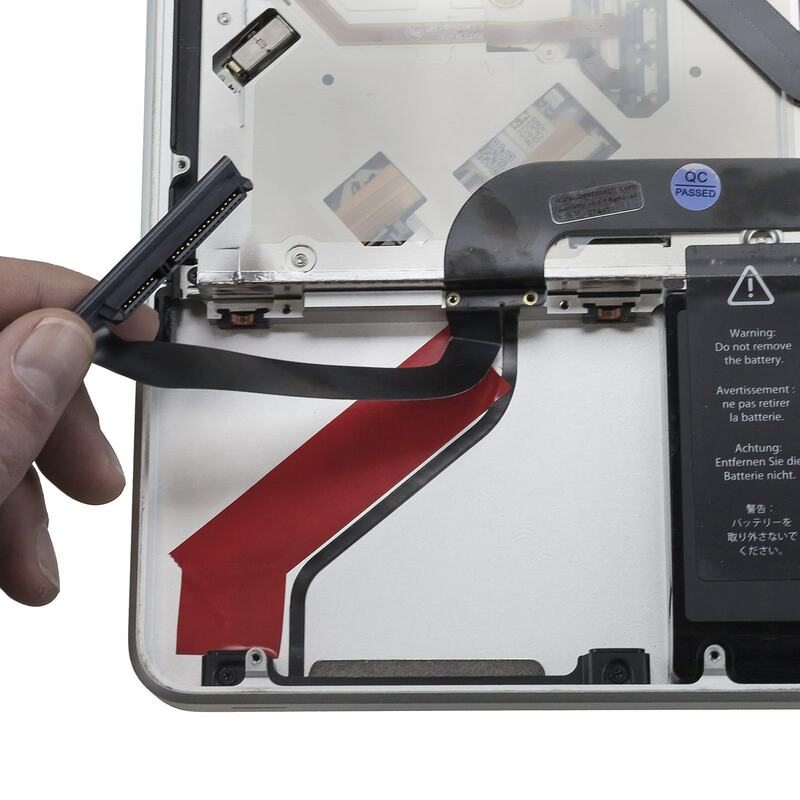 Flat flexible cables (FFCs) are supposed to be thin, but the 2012 hard drive cable doesn’t quite have enough of the plastic film base which surrounds and protects the internal wires. This MacBook’s cable originally was manufactured with part number 821-1480-A printed on it. Apple offered this particular laptop (order number MD101LL/A) for a whopping four years due to high demand for the Unibody series of notebooks, and at some point wised up and began shipping computers with a revised version of the cable. The new cables now included a different part number; 821-2049-A and later 821-2480-A. These cables were designed with a thicker plastic film and offered more protection to the wires. We verified the difference while examining some cables we’ve come across in used computers. This is great news if you were able t get Apple to replace the cable, but new condition cables widely available on the internet may have these part numbers printed on them, but are not the revised cable design. Manufacturers caught on to the fact that the new part numbers were more sought after and they simply started producing the same old cables with the new part numbers. To date, we’ve never been able to find new condition cables with the improved design. And believe me, we’ve been searching. Bummer? Yes, but luckily there’s an easy preventative measure that only requires some supplies you probably already have lying around. All you need to do it yourself is a Phillips PH000 screwdriver and some ESD safe tape. You probably have some common electrical tape which will be perfect for the task. 1. 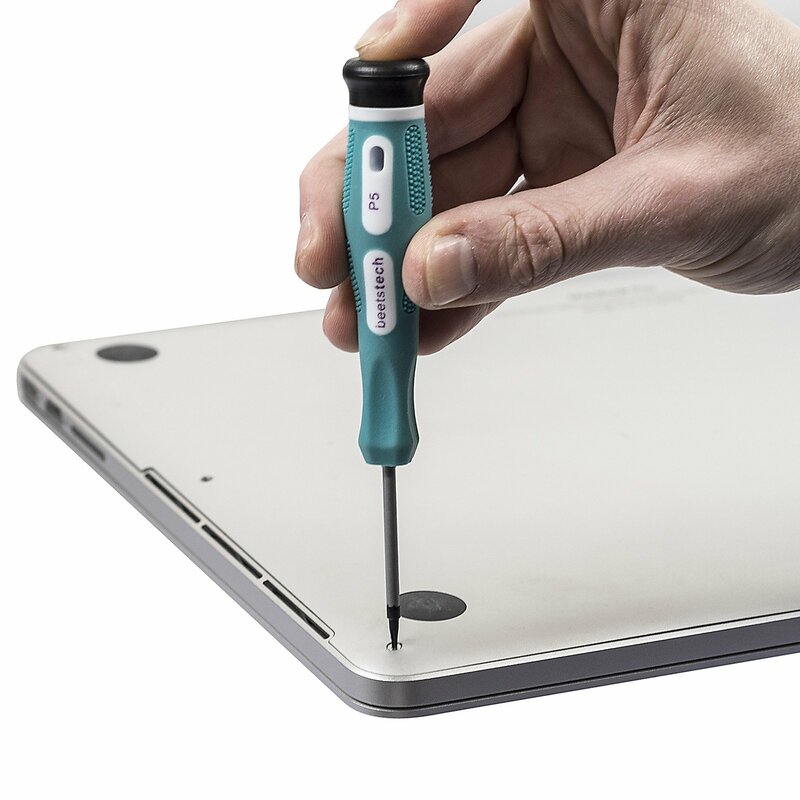 Remove the ten Phillips #000 screws which secure the bottom case and remove the bottom case. 4. Disconnect the hard drive from the hard drive cable and set the hard drive aside. 5. Gently lift up the wide segment of the hard drive cable (the segment not adhered in place) to expose the aluminum underneath and apply tape to the aluminum surface where the hard drive cable will rest. 6. Apply a strip of tape to the top and bottom of the wide segment of the hard drive flex cable. Congratulations! You’ve successfully prevented your Mid 2012 A1278 hard drive cable from catastrophically failing when you’d least expect it. Strip a screw in the process? Check out our stripped screw solution. Now we can’t guarantee your hard drive cable will continue to work forever. Remember, these flex cables fail with some frequency in all of the Unibody MBP laptops. The internal wires are made especially thin and sometimes fail for seemingly no reason at all, but this procedure takes only minutes to perform, costs almost nothing, and gives your cable the best chance at surviving for the long term. Jase is into all things tech, but some might say he's a bit of an Apple fanboy. He also comes up with the best answers when the beetstech staff plays Quiplash. Get our expert repair tips delivered right to your inbox. making this post available, the rest of the site is also high quality. I have a question, it’s kind of weird. I own a Macbook Pro ’13 mid. 2012 A1278, I repleaced the SATA cable a few months ago (the original cable failed), and today I’m trying to install an SSD; everything works flawless when I start the computer with an external adaptor, but when I put the SSD in the internal, it just doesn’t work, but with my HDD it does work. What do you recommend, should I change the SATA cable again? Same model, or an upgraded model? Thank you. Can you clarify exactly what kind of tape qualifies as ESD safe tape? I have old-fashioned black electrician’s tape, the kind that’s shiny on the non-stick side, but I don’t know if it can take the heat or if my MacBook will like it. I see a variety of ESD safe tapes for sale on line. Does this mean the 821-2480-A cable sold by Beetstech also does not have the thicker insulation? With macOS 10.13, otherwise known as High Sierra, Apple introduced an ambitious EFI update. Several of the changes include: the introduction of the Apple File System, support for NVMe drives, and the usual batch of security updates. However, these EFI updates can cause some unwanted behavior when you test your Apple computer’s memory. At Beetstech, we use a long-time industry standard, MemTest86 to perform a comprehensive test of each computer’s RAM. But never the type to blindly accept test results, strange testing outcomes led us to discover a bug in MemTest86 affecting computers running the new EFI firmware. In short, the newly updated EFI causes MemTest86 to incorrectly fail certain tests. But there is good news: while normal operation of MemTest86 is limited under these new EFI updates, we also discovered some simple workarounds for testing your Apple’s memory in MemTest86. So let’s dive into how we discovered the MemTest bug, devised a reliable work-around, and get into some nitty gritty details of MemTest86 operation. They go by “jumper pads”, “short-circuit pads”, “power pads”, and “power-on pads”. Whatever you call them, there are two bits of metal on your MacBook logic board that can force your laptop to boot up, even if the power button won’t do the trick. Anywhere premium products are produced, there are unsavory folks trying to make a quick buck selling cheap knockoffs. It happens in every industry, from clothes to food to tech. But in recent years, counterfeit electronics have surpassed nearly all other categories of counterfeit goods by dollar value, and Apple, being the de facto high-end electronics manufacturer, makes for a prime target. But you’d never be caught buying counterfeit electronics, because you can tell the difference, can’t you? Remember the good ol’ days of carrying a spare battery, upgrading your own RAM, maybe even adding a second hard drive? If you’re an Apple user, those luxuries may be behind us, but upgrading your own solid state drive is still a privilege the Apple overlords allow us to have, for now that is. Despite retaining the ability to upgrade your own SSD, ever since Apple introduced their proprietary “blade” SSDs in 2010, the task hasn’t been as simple as it once was. Apple talks up read and write speeds, but they rarely dive into the nitty gritty details of the technology behind the SSDs they use — drives specially designed only for Apple computers. After countless questions, both from customers and our own staff, we decided to start our own investigation into the hardware involved. You have to be a bit of a private eye to uncover the secrets behind these drives, and the deeper we looked, the more surprises we found. Stay up to date with Beetstech. Articles for repair pros, by repair pros. No spam. Unsubscribe at any time. Don’t worry, we hate bad emails too.